I spent over an hour debugging this problem today, that wasn't a problem. Daylight saving time! Extra hour added for the time shift. AHHHHHHHHHHHHH! JTA wrote: I spent over an hour debugging this problem today, that wasn't a problem. Yeah man tell me about it. I've been getting reaallll intimate with my dates here lately and doing some real nasty things with them that most would scoff and run away at. But sometimes you just gotta take a swig and hold your breath and get down and dirty and nasty and do what needs to be done for that pay check man. bannination wrote: "Luckily I've avoided that kind of work so far...."
I keep my clocks permanently on DST, that way I don't have to change any of them. When DST comes around again they read the right time and I no longer have to do the math in my head to figure out the true time. JTA wrote: "I keep my clocks permanently on DST, that way I don't have to change any of them. When DST comes around again they read the right time and I no longer have to do the math in my head to figure out the true time." Mr b are you making fun of the way I look? You know that's a real life pic of me right? Mr. B. just has no respect for other peoples feelings. JTA wrote: "Mr b are you making fun of the way I look? You know that's a real life pic of me right?" bannination wrote: "Mr. B. just has no respect for other peoples feelings." Please explain I do not get it. Are you jealous of my white-man fro? You know...that "get a real life" saying? No, I'm not jealous...you like mine? 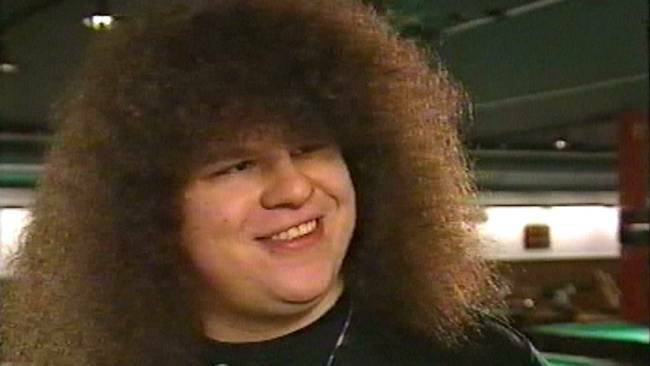 Most beautiful white-man fro I've seen to date, Even better than Messiah Marcolin's. JTA wrote: Daylight saving time! Extra hour added for the time shift. AHHHHHHHHHHHHH! It was even worse when they changed the dates for daylight savings time a few years back. 1.There are always 24 hours in a day. 2.Months have either 30 or 31 days. 4.February is always 28 days long. 5.Any 24-hour period will always begin and end in the same day (or week, or month). 6.A week always begins and ends in the same month. 7.A week (or a month) always begins and ends in the same year. 8.The machine that a program runs on will always be in the GMT time zone. 9.Ok, that’s not true. But at least the time zone in which a program has to run will never change. 10.Well, surely there will never be a change to the time zone in which a program has to run in production. 11.The system clock will always be set to the correct local time. 12.The system clock will always be set to a time that is not wildly different from the correct local time. 13.If the system clock is incorrect, it will at least always be off by a consistent number of seconds. 14.The server clock and the client clock will always be set to the same time. 15.The server clock and the client clock will always be set to around the same time. 16.Ok, but the time on the server clock and time on the client clock would never be different by a matter of decades. 17.If the server clock and the client clock are not in synch, they will at least always be out of synch by a consistent number of seconds. 18.The server clock and the client clock will use the same time zone. 19.The system clock will never be set to a time that is in the distant past or the far future. 20.Time has no beginning and no end. 22.Ok, but the duration of one minute on the system clock will be pretty close to the duration of one minute on most other clocks. 23.Fine, but the duration of one minute on the system clock would never be more than an hour. 25.The smallest unit of time is one second. 27.It will never be necessary to set the system time to any value other than the correct local time. 28.Ok, testing might require setting the system time to a value other than the correct local time but it will never be necessary to do so in production. 29.Time stamps will always be specified in a commonly-understood format like 1339972628 or 133997262837. 30.Time stamps will always be specified in the same format. 31.Time stamps will always have the same level of precision. 32.A time stamp of sufficient precision can safely be considered unique. 33.A timestamp represents the time that an event actually occurred. 34.Human-readable dates can be specified in universally understood formats such as 05/07/11. 1.The offsets between two time zones will remain constant. 2.OK, historical oddities aside, the offsets between two time zones won’t change in the future. 3.Changes in the offsets between time zones will occur with plenty of advance notice. 4.Daylight saving time happens at the same time every year. 5.Daylight saving time happens at the same time in every time zone. 6.Daylight saving time always adjusts by an hour. 7.Months have either 28, 29, 30, or 31 days. 8.The day of the month always advances contiguously from N to either N+1 or 1, with no discontinuities. 9.There is only one calendar system in use at one time. 10.There is a leap year every year divisible by 4. 11.Non leap years will never contain a leap day. 12.It will be easy to calculate the duration of x number of hours and minutes from a particular point in time. 13.The same month has the same number of days in it everywhere! 14.Unix time is completely ignorant about anything except seconds. 15.Unix time is the number of seconds since Jan 1st 1970. 16.The day before Saturday is always Friday. 18.Two timezones that differ will differ by an integer number of half hours. 20.Okay, seconds, but it will be a consistent difference if we ignore DST. 22.You can wait for the clock to reach exactly HH:MM:SS by sampling once a second. 23.If a process runs for n seconds and then terminates, approximately n seconds will have elapsed on the system clock at the time of termination. 25.Days begin in the morning. 26.Holidays span an integer number of whole days. 27.The weekend consists of Saturday and Sunday. 28.It’s possible to establish a total ordering on timestamps that is useful outside your system. 29.The local time offset (from UTC) will not change during office hours. 30.Thread.sleep(1000) sleeps for 1000 milliseconds. 31.Thread.sleep(1000) sleeps for >= 1000 milliseconds. 32.There are 60 seconds in every minute. 34.GMT and UTC are the same timezone. 37.The difference between the current time and one week from the current time is always 7 * 86400 seconds. 38.The difference between two timestamps is an accurate measure of the time that elapsed between them. 47.If you take a w3c published algorithm for adding durations to dates, it will work in all cases. 48.The standard library supports negative years and years above 10000. 65.All measurements of time on a given clock will occur within the same frame of reference. 66.The fact that a date-based function works now means it will work on any date. 67.Years have 365 or 366 days. 68.Each calendar date is followed by the next in sequence, without skipping. 69.A given date and/or time unambiguously identifies a unique moment. 70.Leap years occur every 4 years. 71.You can determine the time zone from the state/province. 72.You can determine the time zone from the city/town. 73.Time passes at the same speed on top of a mountain and at the bottom of a valley. 74.One hour is as long as the next in all time systems. 75.You can calculate when leap seconds will be added. 76.The precision of the data type returned by a getCurrentTime() function is the same as the precision of that function. 77.Two subsequent calls to a getCurrentTime() function will return distinct results. 78.The second of two subsequent calls to a getCurrentTime() function will return a larger result. 79.The software will never run on a space ship that is orbiting a black hole. rstrong wrote: 34.Human-readable dates can be specified in universally understood formats such as 05/07/11. Cary, N.C. — Everyone knows the pecking order in a family has everything to do with age. The oldest sibling usually rules the roost. But what if you get cheated out of the title because of Daylight Saving Time? Peter Sullivan Cirioli was dubbed "Baby A" at WakeMed Cary when he arrived early Sunday morning. “Yes, Peter was born first, it was at 1:32 a.m.,” mother Laura Cirioli said. Thirty-four minutes later, Peter's twin sister, Allison Raye Cirioli, known as "Baby B," made her entrance into the world. Because of Daylight Saving Time, Allison's time of birth was 1:06 a.m., which makes her 26 minutes older than her brother even though he was born first. “We just never even thought about it until after he was born and then we realized it was going to happen. It was really kind of amazing,” Laura Cirioli said. The proud mother and father said they don't really care who was born first, they are just glad to have two healthy babies. They do suspect the daylight savings predicament will be fodder for sibling rivalry. “We'll let them work that out between themselves. I don't want to get into the middle of it,” Jason Cirioli said.